The canton was formed on 26 May 1988. 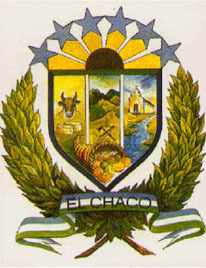 The flag and the coat of arms are shown as drawings on a PDF document available on the website of the Association of Ecuadorian Municipalities. a) Rectangular, with dimensions 1.15 m in width and 1.80 m in length, divided into two equal horizontal stripes, celestial blue and green. b) A white triangle covers the left part, whose vertex reaches 1/3 of the flag's length and the half of its width. c) The triangle charged with a sun whose longer points represent the parish and the lower shine and provide natural life. d) Celestial blue means the power of the celestial vault and the several rivers that water the canton. e) Green means the generosity of agriculture and cattle-breeding. f) White is a symbol of the inhabitants' peace, joy and force, and of the abundant milk production that generates economical welfare.